The American Water Spaniel was developed as an all-around hunting dog, bred to retrieve from skiff or canoes, as they were sometimes referred to as the "Skiff dog". They are an active, muscular dog, medium in size with a curly coat which has oil coating that makes them water resistant. The American Water Spaniel\'s head is moderate in length, with a broad full skull with a strong neck that blends smoothly with the shoulders. It has long ears with close curls, hazel-brown, alert eyes set well apart, and a sufficiently wide nose to ensure excellent scenting ability. All these are attributes that make the American Water Spaniel a great hunting dog. The American Water Spaniel also has a well developed and sturdily constructed back. Primarily a hunting dog, the American Water Spaniel also makes an ideal family pet who will interact well with the entire family. The American Water Spaniels still thinks of himself as a water dog and hunting comes natural to them. The American Water Spaniel is the state dog of Wisconsin. American Water Spaniels are busy, affectionate, friendly, eager, intelligent, and enthusiastic. The American Water Spaniel is much esteemed by huntsmen. They love the water and get a long well with children but can be a bit food possessive. They are highly trainable, eager and busy. They are very friendly and do not make really good guards, but do an adequate job. They are friendly with those they have been properly introduced to. They have the great charm of a spaniel. Bi-weekly brushing of the American Water Spaniel is needed to remove dead hair and prevent matting. Minimal bathing is required. Alopecia, blindness, deafness, epilepsy, heart problems, hip dysplasia, luxating patellas, poor temperament, spinal or neck problems, thyroid problems, and skin problems. 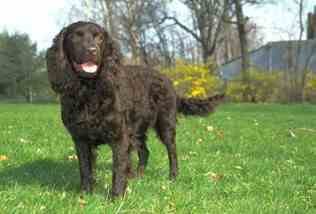 American Water Spaniels require an inordinate amount of physical exercise, and enjoys swimming and hunting. They have a tendency to roam, so daily jogging or walking must be done with the American Water Spaniel securely leashed. They benefit from play sessions such as Frisbee or a game of "fetch". The American Water Spaniel will do okay in an apartment provided they are given sufficient exercise and a securely fenced yard is available. They prefer a home in the country setting with room to run. The American Water Spaniel is slow to maturation and may be two years of age before they are able to settle into a training program. However, they do require extensive socialization at an early age. They may be difficult to housetrain and the crate method is highly recommended. This breed has a highly sensitive nature and does not respond to harsh or heavy-handed training methods. If they are harshly disciplined they may exhibit "fear-biting". It is important that training be done with patience, love, respect, consistency, and fairness.